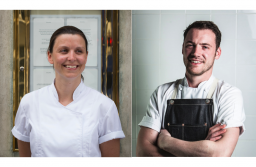 Congratulations to our brilliant chefs Pip Lacey and Tommy Banks for their success in this year’s Great British Menu. The two chefs impressed the judges and beat the competition earlier in the series. They were rewarded with the opportunity to cook their winning dish at the grand summer banquet, celebrating 140 years of Wimbledon. Pip Lacey, head chef at Angela Hartnett’s Murano, won with her stunning starter entitled ‘Whatever the Weather. This was comprised of Tomato water, goats cheese anolini and summer vegetables, served in a large yellow tennis ball style bowl. Tommy Banks of the Black Swan in Oldstead won with his fish course - a Wimbledon-inspired dish of Turbot, with strawberries and cream.